As an owner or property manager, you’re looking for the best products and services to help enhance your business. From the windows in your front window to the handles on the conference room doors, every aspect of your business needs to be in top shape to create a sterling impression for guests and employees alike. When it comes to building renovations, it pays to find a commercial drywall company with the tools and expertise needed to create amazing results that can help improve your workplace. As your trusted team of drywall contractors in Chicago, AZ Drywall Finishing is here to help in any capacity that we can. Our drywall finishers have worked for nearly 20 years to create amazing results for Illinois businesses, and we’re ready to show you the quality difference! The world of drywall is full of tools and terms that may only confuse you while searching for a local drywall company for your business. Today, we’ll briefly discuss the most common types of drywall used today, as well as the value of hiring professionals to help you achieve fast, cost-effective results that are sure to improve the look and flow of your business. When finished, be sure to contact our commercial drywall contractors to receive a speedy and accurate quote! This gypsum sheetrock consists of your standard drywall product and is used in a variety of applications. Your standard baseboards tend to come in ½ inch and ⅜ inch thicknesses and can provide amazing visuals for your room without the high price tag. Professionals often utilize standard wallboards for ceiling applications, where the lighter weight and lessened requirements help to make overhead applications safer and quicker. Also referred to as fire retardant, this sheetrock is designed to offer considerably more protection for your building in the event of a fire. While your standard ½ inch drywall is rated to withstand fire for 30 minutes, fire-resistant boards are able to provide protection for an hour or more. A lot of different factors go into a building’s ability to resist fire, with drywall and fasteners being a top factor in creating safe egress routes for building inhabitants. Installing fire-retardant drywall is beneficial due to the design of this product, where additives such as glass fiber are used to reinforce and halt the transference of flame and heat. While the most costly among drywall options, this sheetrock is vital for rooms with high fire dangers such as the garage and furnace room. While drywall is produced to be a durable wall covering element, it is not impervious to moisture. In residential settings, this sheetrock is utilized in laundry rooms, kitchens, and bathrooms as added protection to prevent warping and help to prevent mold growth. Gypsum panels of this variety can also include fire-resistant cores to provide fire protection in addition to moisture control. Commonly referred to as greenboard, water-resistant drywall is essential for a number of commercial applications. Rooms that do not have adequate insulation or cannot retain heat enough can benefit from drywall that features a poly foam core for beneficial results. Each wallboard piece provides continuous energy-saving measures for your building, relying on quality materials that will not warp. While technically not drywall, these sheets consist of cement with fiber mesh on either side. Typically, cement board is used as backdrops for kitchens and bathrooms, serving as a solid platform for tiling walls and floors. The small, durable construction of this product makes it a versatile option for resisting heat and moisture as well. This type of drywall relies on a standard moisture-resistant gypsum core and fiberglass linings on both sides of the board. While more costly than standard wallboard options, fiberglass’ ease of installation and increased moisture resistance has helped to make it a popular choice in the industry. Finding sheetrock that can withstand the punishment of high-traffic areas will help to keep the interior of your business looking great for a long time. This style utilizes enhanced paper coverings and an improved core to help prevent damages from impacts, abrasions, and more. From hallways to classrooms, damage-resistant drywall is a smart choice for many companies. 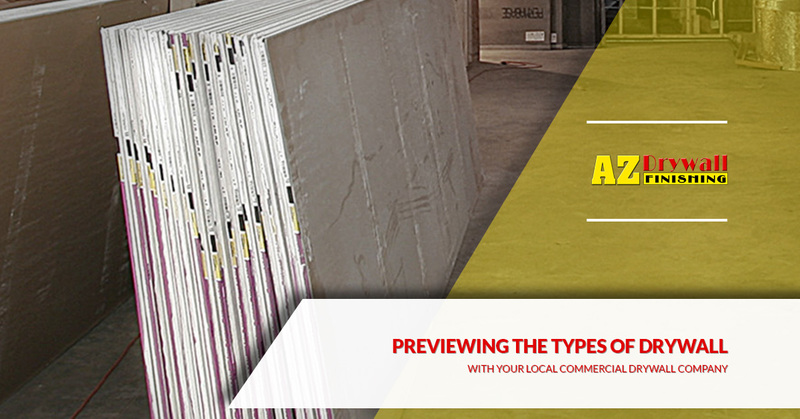 Beyond finding the right material for your business is the importance of finding a quality commercial drywall company that cares. Since 1999, our drywall contractors in Chicago have worked hard to perfect our installation and finishing services. AZ Drywall Finishing is here to serve as your source for comprehensive drywall services in Illinois, and our highly trained staff are here and ready to help. Contact us today to learn more about our services or to receive a quote for your building!